India Automotive Lighting Market is expected to garner $3.1 billion by 2022, registering a CAGR of 5.6% from 2016-2022. Lighting is a vital component in automotive vehicles, playing an important role in automotive safety. The vehicle consists of different lights to increase the visibility in darkness and bad weather conditions along with the increase in conspicuity. The lighting system comprises lighting and signaling devices, which are placed at different locations such as front, rear, side, and interiors. Lighting provides illumination for the driver and helps other vehicle drivers and pedestrians on the road to detect the vehicle’s position, direction of movement, and size. It also enhances the aesthetic looks to both interior and exterior parts of the vehicle. Key players profiled in the report include Koninklijke Philips N.V., Phoenix Lamps Limited, Lumax Industries Limited, Osram Licht AG, GE Lighting, Magneti Marelli S.p.A., Koito Manufacturing Co. Ltd., Hella KGaA Hueck & Co., Valeo, and Neolite ZKW Lightings Pvt. Ltd. Growing emphasis towards road safety: Rising number of road accidents during bad weather conditions and night is the prime concern among vehicle drivers. This has risen the demand for reliable and brightened automotive lights. Therefore, the growing emphasis over enhanced road safety through high-performance automotive lights has created the need to develop advanced lights providing better illumination in the darkness. Emerging government regulations: The Indian government has formulated various regulations regarding sufficient installation of lighting equipment in passenger vehicles. Few regulations are still in the process of being laid down to improve the safety of vehicle in bad weather conditions. The regulations regarding energy-efficient vehicles support the installation of LED lights in vehicles. Thus, such regulations are expected to fuel the growth of the automotive lighting market. Growing automobile sales: Automobile sales has witnessed notable growth rate in India. The revival of economy has particularly supported the growth in the recent past. This growing trend is expected to continue during the forecast period with sizeable demand of passenger vehicle and two-wheelers. Automotive lighting industry, which depends on the state of automotive industry for its growth, is expected to certainly benefit from this ongoing rising vehicle sale. Low purchasing and replacement cost along with the easy availability of halogens supplement the adoption of halogens in automotive lighting. Factors such as the enhanced aesthetics and longevity of halogen lamps are key factors that influence the halogen market. However, the high energy efficiency of LEDs is a key factor that is expected to limit the adoption of halogen lights during the forecast period. At present, a major factor that restricts the LED market growth is its expensive price; however, the ongoing technological advancements are anticipated to result in the lowered costs of LEDs in the future. This may lead to a decline in the sales of halogen lights towards the end of the analysis period, which is attributed to the increasing adoption of LEDs as an effective replacement for halogen lamps. Halogen automotive lights are offered by all the leading players in India. Osram recently developed the Night Breaker Unlimited, a halogen automotive lamp with improved brightness, longer focus, and whiter light. These headlamps also provide better visibility and response time. Philips also offers a wide range of halogen automotive lamps with white, blue, and yellow illuminations. The study provides an in-depth analysis of the India automotive lighting market, with current trends and future estimations to elucidate the imminent investment pockets. The report provides information regarding key drivers, restraints, and opportunities with an impact analysis. Porter’s five forces and SWOT analysis of key market players highlight the growth strategies adopted by them. 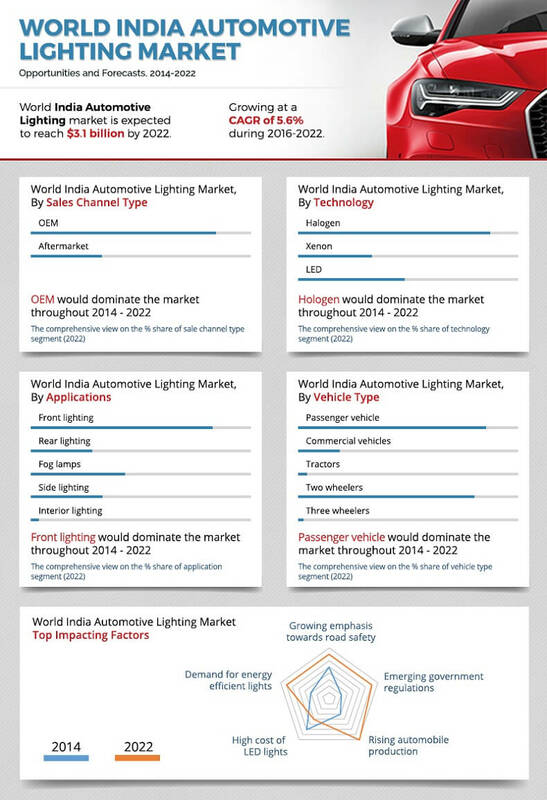 The India automotive lighting market is segmented based on lighting technology, application, vehicle type, and sales channel type. 8.4 Koito Manufacturing Co. Ltd.
8.5 Hella KGaA Hueck & Co.
8.10 Neolite ZKW Lightings Pvt. Ltd. FIG. 28 SWOT ANALYSIS: MAGNETI MARELLI S.P.A. The automotive lighting market is currently witnessing a steady growth due to the growing automotive production across the country. Growing population and increasing purchasing power mainly contribute to the market growth. Automotive lighting plays a substantial role in automobile safety by increasing the conspicuity of the vehicle. 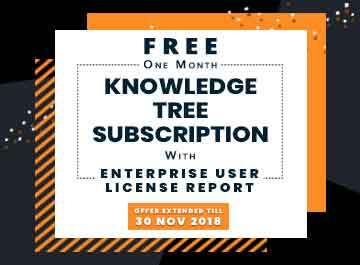 In addition, the rising emphasis on vehicle safety and government regulations regarding automotive lighting systems further stimulate the market growth. A wide variety of automotive lights are available in the market, such as front lighting, rear lighting, side lighting, fog lamps, and interior lighting. In the year 2014, front lighting accounted for maximum revenue, and is expected to continue to lead the market by 2022 as well. Traditionally, halogen was the majorly used lighting technology. However, the ongoing innovations in LED lighting technology to provide bright illumination and a compact size fuel the demand of these lights. LED lights are used for a variety of functions such as low beam, high beam, turn signal, parking lights, and day running light. Longer shelf life proves to be a major advantage of LED lights, thereby increasing their installation. The passenger vehicle market is expected to continue to maintain its leading position, in terms of market value. Key players operating in the market include Koninklijke Philips N.V., Phoenix Lamps Limited, Lumax Industries Limited, Osram Licht AG, GE Lighting, and others. These industry players focus on introducing advanced LED lighting solutions as well as on expanding their presence in the growing automotive market.